Easy cash advances are often predatory lending practices because of the cost of financing as well as the typical clientele. Lenders who offer these programs may be taking advantage of a low income or needy borrower in order to make a large profit on a very small loan. 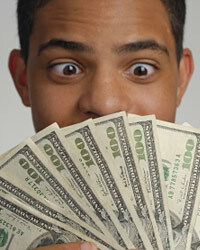 A cash advance uses a future paycheck as collateral. The lender gives the funds due on the paycheck in advance and then expects to be repaid, plus interest, once the borrower has been paid. The interest rates on cash advances are extremely high. Further, late payment fees are very high and add up very quickly. Lenders offer this option well-aware that the borrowers are not credit worthy in most circumstances. Therefore, they assess these very high fees to protect against the risk. Some lenders offer cash advances as a way to collect personal information, like bank account numbers or social security numbers, from unsuspecting individuals. Instead of seeking an advance from a pay day lender, ask your employer about potential advances or loans against your paycheck. You may find your employer willing to extend the financing, which is safer than going to a third party.